From #Rhodesmustfall to #Feesmustfall, South Africa’s young people are taking the transformation of society into their own hands. The recent upsurge in student demonstrations started as a protest against fee increases at WITS University on 14 October 2015. This wave of protests is about far more than simply a monetary problem. It also brought to the surface glaring inequalities between the ‘haves’ and the ‘have-nots’. The situation has further taken on racial undertones, and presents an example of how violence repeats itself when a state neglects reconciliation and transformation. In this way, #Feesmustfall reflects deeper issues concerning South Africa’s incomplete peacebuilding process. In an Institute for Justice and Reconciliation study published in 2010, South Africans identified the following benchmarks for transformation: good governance and greater political participation; economic equality; job creation and poverty alleviation; and a higher quality of social goods and services, such as access to health and education. Judging by these indicators, it would seem the country’s transformation process is far from complete. Similarly, the New Deal for Engagement in Fragile States also recognises that certain intervention measures must be undertaken to reduce the risk of relapsing into conflict. These include addressing drivers and root causes; enhancing social cohesion and trust among social groups; and building faith in and legitimacy of governments. South Africa’s constitution and laws uphold these principles, and an attempt at reconciliation and redistribution has been made through a number of policies and strategies. These include the Truth and Reconciliation Commission (TRC) and the Reconstruction and Development Programme. Yet government often fails when it comes to implementing these mechanisms, and many citizens see the TRC process as largely political and elitist. Free basic education and access to higher education are guaranteed in the South African Bill of Rights. However, these policies have not promoted structural changes. All no-fee schools are still in rural areas and townships, but these schools do not provide a standard of education equal to those in urban areas. Furthermore, government’s funding for poor students through the National Student’s Financial Aid Scheme is not enough to cater for most of the students who need it. 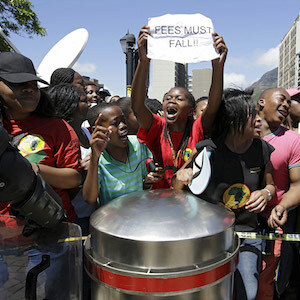 President Jacob Zuma announced a 0% increase in student fees for 2016, but demonstrations continued at many South African universities, with students fighting for the right to free education and the end of outsourcing of university staff. As the government scrambles to find funding for the R2.6 billion shortfall for higher education institutions for 2016, as well as new strategies that could fund free tertiary education in South Africa, possible solutions range from seeking private sector funding to increasing taxes. Government should, however, be wary of fuelling already existing tensions between the majority of poor South Africans and the minority taxed citizens, who already feel that this transformation will be undertaken at their expense. The protests also raise other important questions regarding how South Africans perceive and relate to one another. Should middle class South Africans share responsibility for the burdens of poor South Africans? And what would that mean, practically speaking? Also, to what extent do we need to keep looking at the past to make sense of the present? There are no immediate answers to these questions. Prolonged dialogue within society is needed before major decisions that affect all South Africans are undertaken. South Africa has tried to divorce reconciliation from transformation. Achieving this is not possible, however, as these are mutually reinforcing processes. The issues driving the student uprising go far beyond the unaffordability of higher education for poor families. The real problem is that the education system mimics the society we live in – a lack of transformation, and perpetuation of inequality. With 45% of South Africans living in poverty, it is almost impossible for the poor to afford the school fees required to access quality education. The result is that apartheid-era structures of poverty, power and privilege are perpetuated; and the disadvantaged continue to respond with violence. As it responds to #Feesmustfall, government should address the greater societal problems highlighted by this campaign. Confronting inequality means prioritising access to all goods and services, including education. The lack of access for poor South Africans to education, health and jobs will continue to trigger violence in years to come. Government needs to undertake an inclusive process of dialogue in reaching consensus on a way forward. Innovative measures for addressing inequality are needed, and this will require involving other actors – including the private sector, which largely benefitted from the apartheid regime. Most importantly, government needs to work at rebuilding the trust of South Africa and its youth: not simply carry on with business as usual while the education system faces a crisis. A zero percent increase for tertiary fees next year hardly scratches the surface of interventions needed to address the current crises. There is a growing restlessness in the country, even the presumably apathetic youth has now spoken out in a powerful voice. Government needs to involve civil society in addressing these problems, and it must create safe spaces and an environment that makes it easy for individuals and organisations to be actively involved in its transformation. Only once this happens can South Africa hope to find a path to lasting peace.